WEST LAFAYETTE, Ind. — As winter weather approaches, Purdue University is advising students to prepare. Wear several layers of lightweight, warm clothing. Wear a hat to prevent body heat loss from your head. Scarves and hoods also help. Use mittens that fit snugly at the wrists. Mittens are warmer than gloves because fingers maintain their warmth better when they are in contact with each other. Reduced surface area reduces heat loss. Wear boots or shoes that provide good traction. Waterproof/resistant boots are also a good idea. Wet socks/feet lose heat much faster than dry socks/feet. Take the Purdue tunnels and enclosed walkways. CityBus is free to everyone with a Purdue student, faculty or staff identification card. Bus stops are located all around campus, and buses run throughout Lafayette and West Lafayette. The university considers many variables when making decisions about schedule changes due to weather, said Carol Shelby, senior director of environmental management and public safety. For example, in addition to temperature and wind chill, administrators consider the entire forecast for the day, snow cover, anticipated snowfall, icing, the conditions of roads and parking lots, and the ability to heat buildings and remove snow. Consideration also is given to how far people need to walk outdoors, which is greater for students than for faculty and staff, most of whom park in lots and garages near the campus. 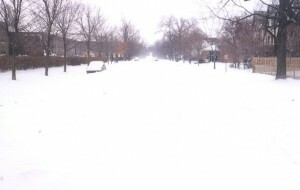 Information about the weather-related status of classes and work at the university, as well as weather information, wind-chill charts, frostbite and maps of the tunnels and CityBus routes, are available from Purdue Home Page, http://www.purdue.edu. Just click on Weather.